Jean Meyer is president and CEO of St. John Providence health system. Transportation is too often overlooked as a factor with a big influence on individuals’ health and the health of our communities. We know and see this first hand at St. John Providence every day. Unfortunately, southeast Michigan is the largest region in the country without a reliable regional transit system. This negatively affects individual, community and public health. Disconnected transit prevents people from getting to doctor appointments, the grocery store and work every day in southeast Michigan. But this November, we have the opportunity to change that and connect our communities. We believe a healthy regional transit system will help lead to a healthier region. That’s why we’re urging a “vote yes for regional transit.” Reliable public transit will boost health and wellness and improve access to health care and jobs across Macomb, Oakland, Washtenaw and Wayne counties. St. John Providence is one of the largest providers of inpatient care in southeast Michigan, as well as one of the region’s largest employers. Thousands of patients and employees travel to our seven hospital campuses and hundreds of physician offices and medical centers daily. We see the negative effect of disconnected transit every day. Our ability to meet the needs of our patients depends on the nearly 16,000 southeast Michiganders we employ. Reliable transit is essential to get to work. Unfortunately, few of our employees can regularly rely on regional public transit to do that. And for patients, an inability to get medications, get to their physician’s office, or get to screening and diagnostic tests leads to unnecessary hospitalizations, exacerbation of illnesses and delays in critical treatments. Increasing access to critical healthcare services is essential for population health. Disconnected regional transit, however, negatively affects the efforts of the entire health care community to improve access. Seniors and people with disabilities, who rely on regional public transit to maintain mobility and independence, too often suffer the consequences. Patients missing appointments due to a lack of transportation is a major issue, but our patients also can’t get to grocery stores to get the healthy food they need, for example, to maintain and improve their health. 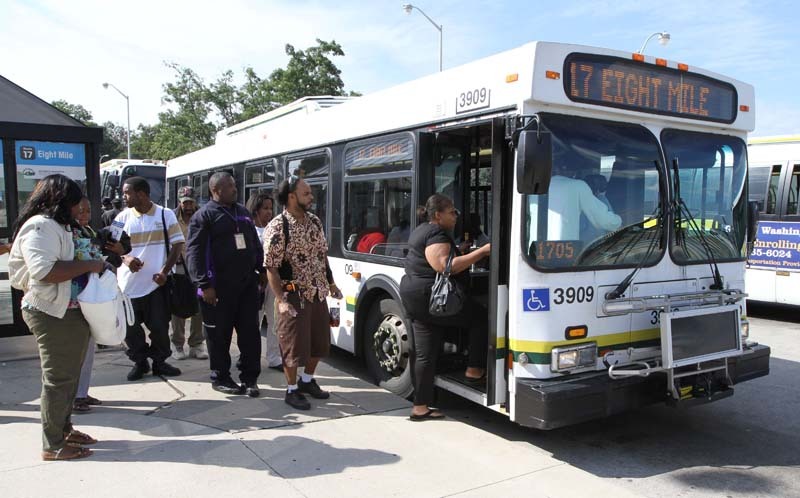 The Regional Transit Authority has outlined a comprehensive, viable and cost-effective solution for southeast Michigan to reliably connect our communities in Macomb, Oakland, Washtenaw and Wayne Counties. Connected regional transit can and will improve the health of residents and our communities throughout the region. Reliable regional transit is not just about connecting people to health care services, grocery stores or jobs. Connected regional transit would be an economic boon for Southeast Michigan and all who live, work, do business and play here. The American Public Transportation Association studies show that for every $1 invested in regional transit, $4 is returned in economic value. That means new jobs, companies expanding or coming to the region, vital infrastructure construction and growth occurring around transit lines. The bottom line is simple – this is the kind of infrastructure investment we need to grow our economy, connect the region and ensure healthy lives, communities and businesses. Connecting our communities will move the region forward. At St. John Providence, we are 100 percent committed to supporting efforts that not only improve access to critical health care services for our patients, but will also help our employees get to work. Vote yes for connected regional transit this November. It is vital to improving the health of southeast Michigan. Ms. Meyer, can you explain to everyone why the RTA will be able to "provide reliable public transit", when the constituent agencies (i.e. SMART, DDOT, AMTRAK & to a lesser extent "TheRide") have been unable/unable to do so for nearly a century? Why we are asked to pay (again) for something that entities like SMART, DDOT and TheRide already provide? And regarding your economic benefit argument; since you are proposing that the majority of residents here in Southeastern Michigan who do not use mass transit pay for it, are you implying that there is no absolutely economic value for the local businesses we do currently support each day (i.e. local restaurants, gas stations, etc.)? Do those business not hire local residents? Do they not purchase their supplies from other companies (some local)? Do they not use the services of other local companies? You ever hear of Saudi Arabia and gas..? That's where your money at the pump is going dude. Gas stations aren't even allowed of thinking of making profit at the pump. They make their money off selling stuff in the store. Also, where does car insurance money go? What if your family only needed one car? That's money for you, dude. I tried to read this; nearly drowned in a lot of promotion for St. John's but came up for air in time to save my life, another health result. I gathered that the lady wants us to vote for a public transit system so that other people can be healthy by visiting their doctors and drugstores, or something. Thinking further; these cheap transit systems also allow access for thieves, rapists, muggers and even murders to new virgin territories, fresh victims-more entertaining ways to exercise their violent impulses. And of course, we had 1 dead and a hundred injured yesterday on a public transit scam in Hoboken, NJ. Oh so many healthy and health giving results! But that's not why I'm contributing, No one at Bridgimi seems to see the obvious. Uber delivers an excellent ride for half the cost of a taxi. What is more interesting is that Uber wants to replace all their drivers with self driving cars. What has to be most relevant for voters in SE Mich. is that Uber is testing a fleet of Volvos modified to be self drivers in Pittsburgh. Pittsburgh of all places! The ultimate challenge. If they can survive a winter of snow, steep, curved, complex roads in P'burgh, they can roll in flat, boring Detroit and LIvonia in a snap. Costs will be low, efficiency, convenience and satisfaction high. Who will walk a half mile, stand in the snow or rain, bump along for a trip with 10 or 40 paranoid strangers and be dumped a half mile from their destination when they can punch in a request for Uber or Lyft to send a private vehicle, enter 5 minutes later, get whisked safely to the front door of the destination while the vehicle trundles off to pick up the next customer and a small charge made to the credit card? I predict the Uber will prevail in 3 years, well before the public transit authorities can start spending their tax windfall on yet another great leap forward. I was thinking the same thing as Erwin - use Uber and have the hospital pay for it (that was my thought). It's cheap, and then we people who don't use RTA won't have to subsidize. Why should north Oakland County in any way be supportive when it's not going to be used here? They always keep chipping away at our hard earned money. My taxes just go up and up - never down - and the paycheck doesn't go up. Well it has all been said above. Since I can't think of anything positive to say either lets not vote for another boondoggle being tried to push through by a selfish group of entities who in the face of solid reasonable opposition will still try to force this unwanted unwarranted expense to the public. A public that is making a strong effort to plow through the Lansing's Republicans growing negative record of espousing hurtful financial issues upon citizens who can't afford what has already been forced upon them. No one in the Republican minions of Snyder has evidenced any effort that truly benefits their constituency . They continue to find and espouse ways to force more financial woes down upon those that can't afford any more bad legislation and espouse harmful non-beneficial self serving issues. For Gods sake people get out and vote this November for change in Lansing. If you don't then you will continue to be offended mentally and financially by those who just don't care about you and your future welfare in Michigan. It is mind boggling that Michigan's citizens continue to punish themselves at the voters booth time after time after being brainwashed by the big business purchased media espousing their own people for their own selfish purposes. Wake up people before its too late - once more to late! Wow, a lot of goggly gook puff crème in this op ed by Ms Meyer. This type of RTA transportation may be outdated before too long. Metro Detroit never had mass transportation because of the auto industry and the masses in our area will never get used to it. A Metro Detroit Mass Transportation system in my opinion will never work like other big cities because you will only have the poor using it. I don't intend that to be a mean statement, but our culture in Metro Detroit will not support using it. All the commenters above do not understand. The few mass transit riders want other people to pay for it. It's the democratic way. So much for Bridge being non-partisan.